If you’re a Royals fan searching for signs that the team’s improbable run will have a Hollywood ending, Game 2 of the World Series on Wednesday sent a message straight to your brain’s oversensitive destiny center. According to Elias Sports Bureau, before last night no team had used five pitchers in a single World Series inning since Game 7 in 1985 — the one that ended with the Royals winning their lone championship. And the Royals’ 7-2 victory in Game 2, which sent the series to San Francisco at one game apiece, was sealed during another inning in which their opponent used five arms. Don’t call it fate; call it coincidence. Kansas City is content to call it a win. The details were different, of course. In 1985, the five-(al)arm fifth inning didn’t decide the game — the Royals were already up 5-0, with an unhittable Bret Saberhagen blowing through the Cardinals, so the six runs Kansas City scored were just an excessively comfortable cushion. In 2014, the five-run sixth, powered in part by two of the Royals’ hardest-worked and hardest-worn players, proved pivotal. And some of those runs might have been avoided, had Giants manager Bruce Bochy — the skipper in this series with the superior reputation and résumé — not walked into a trap that costs teams all too often. Although some questionable statistics circulating before the game had suggested that both starters were destined for drubbings, the game was tied 2-2 after five. Royals starter Yordano Ventura’s calling card is velocity: According to ESPN Stats & Info, Ventura delivered 108 of the 113 pitches of at least 100 mph thrown by pitchers who made a minimum of 10 starts this season. The Giants, supposedly, were well suited to handle Ventura’s velo, batting .275 and slugging .387 against pitches 95 mph or faster during the regular season — the third- and fifth-best marks in the majors, respectively — before leading all teams with a .377 average against such pitches this postseason. The Royals’ starting lineup, meanwhile, had batted .313 and slugged .510 in 147 lifetime at-bats against Giants starter Jake Peavy. There are two common ways in which stats can mislead: They can omit important context, or they can be based on samples that are too small to tell us anything about the future. The Royals’ punishment of Peavy belongs to the small-sample group: Past studies have shown that even hitters who’ve owned particular pitchers aren’t more likely to continue to crush them than their overall stats would suggest. And the Giants’ batting and slugging average against blistering fastballs — which, were those numbers meaningful, would be relevant in relation to multiple members of K.C.’s staff, which led the majors in percentage of fastballs thrown 95 or above — combine small samples with missing context. Those numbers tell us how the Giants hit against 95-plus fastballs, but they can’t give the full picture: The Giants chased 95-plus heaters out of the zone at the fourth-highest rate this season, and their miss/swing rate ranked eighth-highest. Perhaps predictably, then, the drubbings didn’t happen, with each starter allowing only two runs through the first five innings. Of course, that’s another potentially deceptive stat. Although Ventura’s and Peavy’s lines looked respectable through the fifth, neither had pitched particularly well, amassing only three total strikeouts and allowing a number of hard-hit balls that didn’t burn them. According to ESPN’s TruMedia tool, the typical team produced 5.2 hard-hit balls per game this regular season (as judged by video scouts at Inside Edge). In Game 2, the teams combined for 16 hard-hit balls (five of which resulted in outs). Even as both pitchers posted zeros and ones, it was hard to escape the sense that sooner or later, the bats would break out and the line drives would do damage. Facing the heart of the Giants’ order for the third time in the top of the sixth, Ventura sandwiched two singles around a fly out, prompting Ned Yost to summon Kelvin Herrera to deliver the Royals from the two-on, one-out jam. Bochy could have and should have recognized Ventura’s struggles as a cautionary tale. Peavy was also about to embark on his third trip through the 3-4-5 spots — a dangerous assignment, given the substantial penalty pitchers incur in subsequent plate appearances against hitters in the same game, which shows up in both Peavy’s career stats and his 2014 performance. Some important aspects of starting-pitcher performance aren’t intuitive. Most fans — and judging by their behavior, most managers — believe that how a starter has been pitching within an outing, and how many pitches he’s thrown, are good guides to his future performance within the same game. Research by Mitchel Lichtman, a prominent sabermetrician and coauthor of The Book: Playing the Percentages in Baseball, suggests that isn’t so. Lichtman’s work shows that how a starter has performed through his first x innings doesn’t predict how he’ll do in inning x+1: All starters suffer the same times-through-the-order effect. Nor does pitch count appear to matter. “I found around the same penalty … regardless of pitch count,” Lichtman told me via email. “In other words, if a pitcher sees a batter the third time, he probably has the same penalty whether he has thrown 75 or 85 pitches.” If managers have an ability to tell which starters are about to collapse and which will keep cruising, it’s difficult to see in the stats. Allowed to continue pitching, Peavy allowed a leadoff single — softly hit, admittedly — to Lorenzo Cain, then walked Eric Hosmer on six pitches. Then the bullpen parade began. Bochy went to righty Jean Machi, who allowed a run-scoring single to Billy Butler, then inserted lefty Javier Lopez, who retired Alex Gordon. We’ll never know whether disaster could have been averted had Bochy been a bit more aggressive, using Lopez against Hosmer two batters earlier, or even starting the inning with Sergio Romo or highly effective short/long-man Yusmeiro Petit, a potential series X factor who’s been a nonfactor thus far. Had Bochy done that, the stage might not have been set for Hunter Strickland to send Kauffman Stadium’s deafening crowd home happy. The hard-throwing Strickland entered the game with four 2014 postseason home runs on his record — one more than the Royals’ late-inning trio of Herrera, Wade Davis, and Greg Holland have allowed all year. However, Strickland was coming off a scoreless inning at the end of Game 1 that Bochy described as a “great outing” before Game 2. Bochy added that Tuesday’s inning “had to do a lot for [Strickland’s] confidence,” and it restored the skipper’s confidence, too, prompting him to say, “I was very encouraged how he threw the ball.” And so Bochy summoned Strickland to try to preserve a one-run lead with Salvador Perez and Omar Infante due up and on deck, respectively. Before the series, I wondered whether the long layoff after the ALCS would particularly benefit Perez and Infante, two of the Royals’ hard-worked and worn-down position players. If this series goes seven, Perez will set the single-season record for innings caught; he’ll take possession of the second spot during Game 4. Infante has started every game since late August despite a nagging shoulder injury. Both players’ bats tanked in the second half as they played through fatigue and inflammation: Perez started swinging at pitches outside the strike zone more than any other hitter, while Infante’s power evaporated and his throwing arm lost strength. Perez had hit a solo shot in Game 1; Infante had doubled and scored in the second inning of Game 2, recording his first extra-base hit since September 23, and his arm strength seemed to be restored. Facing Perez, Strickland threw a wild pitch that advanced the runners, then served up a hard double to left-center that drove in two. Infante followed and drove a 98 mph four-seamer over the left-field fence and into the Royals’ bullpen for his first homer since August 13. Maybe the rest did do them good. Strickland, frustrated, yelled at Perez as the batter paused at the plate, spawning one of the sport’s signature almost-brawls in which players mill around aimlessly but never coalesce into physical conflict.1 When the sound and fury subsided, the Royals were up 7-2, and the scoring was over for both sides. The sixth was decisive, as it so often is. In October, of course, aggression is good. “You get to this point where every game is a must‑win, and you do manage it differently because you don’t really worry about tomorrow,” Yost said before Game 1. Bochy, perhaps, could have taken that lesson to heart in Game 2. However, we shouldn’t pretend that a manager made all the difference. Most managerial decisions don’t result in large swings in win expectancy: It’s the players whose actions determine the outcome. 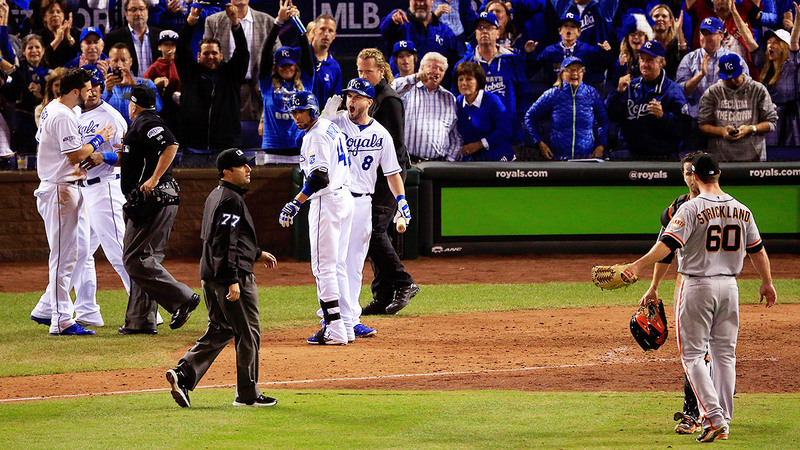 And in Game 2, the Royals followed their blueprint better. • Although it seems as if Strickland has thrown everything in October over the heart of the plate, he ranks 38th out of 52 postseason pitchers (minimum 50 pitches thrown) in grooved-pitch percentage — the percentage of pitches thrown within a baseball’s width of dead-center in the batter’s zone. (Peavy ranks second.) Grooved or not, however, Strickland’s hard, flat fastballs have proved easy to elevate. The only other reliever to allow five homers in a single postseason was Chris Narveson in 2011. • There’s more evidence that rest helped the Royals: After an ALCS Game 2 start in which his average four-seamer velocity fell to 96.6 (his lowest mark in any start) before he left early with shoulder stiffness, Ventura’s velo rebounded to 97.9 on Wednesday, close to his 98.3 full-season average. • In case you weren’t convinced the Giants haven’t necessarily solved fastballs, the Padres, the worst-hitting team in baseball, ranked ahead of the Giants in slugging percentage against 95-plus fastballs. What’s more likely, that the root of the Padres’ offensive problems was not facing enough flamethrowers, or that performance against a subset of a single pitch type depends more on timing and luck than on true talent? • Asked about controlling the Royals’ running game before the series, Peavy said, “We’re going to have to do all we can do with varying our times, holding the balls.” According to PITCHf/x data provided by Baseball Prospectus, in Game 2, Peavy actually varied his pace from pitch to pitch with men on base less than he had in every start this season but one. However, he did hold the ball for an average of 29.6 seconds between pitches with men on base, the fourth-longest delay he’s shown in any start this season. Alcides Escobar was the only Royal who attempted to steal off Peavy; he was thrown out, thanks in part to a smooth pick from Joe Panik. • In my Game 1 recap, I noted that James Shields showed poor command of his changeup, which he abandoned for a few innings after throwing six in the first. We can quantify that: According to COMMANDf/x data from Sportvision/MLBAM, which compares each pitch’s location with the position of the catcher’s glove at the moment the ball is released, Shields’s changeups missed their targets by an average of 20.8 inches, 6.8 inches more than Shields’s regular-season norm and 7.0 inches more than the major-league average. Harry Pavlidis of Baseball Prospectus and Mark Simon of ESPN provided research assistance for this article. Three Royals relievers sprinted out of the bullpen to join the scrum, only to pause when they reached the infield dirt, look around sheepishly, and amble back to the bullpen as if they’d just been exploring the scenery.